We are putting together our first ever Music Blog Zeitgeist for 2007. Part of it will be the best albums released in 2007 as decided by music bloggers. Look for the full zeitgeist in early January! Last night we launched our improved badge page. We think you’ll dig it because now you can take literally anything from our site and show it off on your own blog or Myspace page. You can even customize the color schemes. As always, we are always tweaking and improving, so let us know what you think! We’re Nominated For A Plug Award!! And we need your help to win! Read below to see how to vote for us. The PLUG Independent Music Awards have been going on for a few years now. Each fall, an advisory board of ~300 people select nominees in over 30 categories like best Americana Album, Best Record Label, Best Album Packaging, Best Live Act and more. Then the nominees are set loose for the public to pick the winners! So if you enjoy using Hype Machine, please click and vote for us! ** You don’t need to fill out the whole thing, but need to vote in at least 5 categories before submitting your ballot. Voting is open till February ’08 so you have plenty of time to meet new people, become their friends and then introduce them to Hype! 🙂 If we win, we plan to get drunk, party rockstar style, convince Anthony to wear the cat equivalent of this to the ceremony in March… and document the whole thing! Symbaloo‘s premise is simple. Create a customized homepage with drag-n-drop search modules and shortcuts. Sure there are at least a dozen other sites competing for your homepage spot with news headlines, rss feeds, weather modules and more. The thing that caught my eye about Symbaloo is it’s clean and unique design approach. I also really like that you can customize everything before even signing up for an account (like we do with Hype accounts). This is a growing trend I really enjoy; giving every visitor to your site full features to experience and fall in love with, before making them commit to sticking around (and signing up). 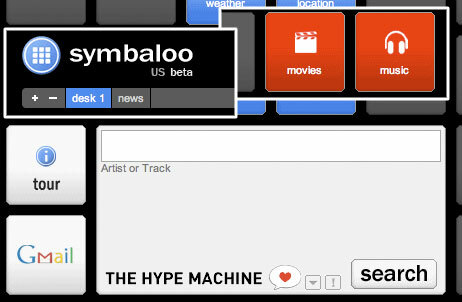 Symbaloo were nice enough to add us to their music search module. If you head to their front page you will see a red Music box in the top right corner. Click it and then you can customize your default search to HypeM by clicking the small down arrow in the grey search area.